Synthetic drugs in the mining industry and other Australian workplaces are on the rise! Workers are increasingly seeing synthetic drugs, especially amphetamines, as an acceptable alliance in their careers. Yet the consequences of substance abuse for the individual and the company can be devastating. While the association has been made between mining and synthetic drug use, this issue is certainly not confined to any one industry. Studies are finding more and more that high stress jobs with tight deadlines, lack of work/life balance, and lack of support are leading people to use drugs, particularly amphetamines, in order to ‘achieve’ the goals that are set for them, or that they have set for themselves. Lawyers, engineers, hospitality workers, construction labourers, and advertising creatives have all reported an increase in synthetic drug use. Join AmCham on September 19th, as Rod Bridge and David Hobbs from Sideffect Australia and Chris Waterman, former West Coast Eagles champion discuss synthetic drugs in the workplace, their impact on business, and Sideffect's programs designed to help combat the issue. Chris “Muddy” Waterman is a former West Coast Eagles champion player. He played 177 AFL matches including 22 finals and 3 grand finals, winning 2 premierships for the West Coast Eagles and earning “Player for Life” status. Chris’s son Alec was also recruited by the Eagles, and was one of Preston Bridge's best friends. Chris has a sports management business called Inside 50 who manage a number of players from the AFL and other codes. An active member of the community, Chris brings a great deal of experience in developing and mentoring young to reach their potential. Rod Bridge is the founder of Sideffect and the father of Preston Bridge, who tragically lost his life in 2013 after taking just one tab of synthetic LSD known as 25iNbome. Rod then flew to China undercover as a drug dealer with a crew from 60 Minutes to uncover the sinister world of the synthetic drugs trade. Since Rod’s trip, 116 different synthetic and research chemicals have been banned in China, and over 23,000 citizens have been charged and arrested with manufacturing these drugs many of which had been destined for Australia. The Bridge family were also responsible for helping put the world’s largest drug dealer and creator of “The Silk Road”, Ross Ulbrich, behind bars for 2 life sentences. 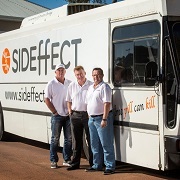 David Hobbs has one of the most diverse resumes of any in Western Australia and now joins Sideffect as a Director. He was formerly CEO of the largest real estate group in Australia, Professionals, with 64 offices throughout WA and NT. David was also CEO of Greyhounds WA, where he raised $17.5 million to construct the new Greyhounds WA facility at Cannington. David helped to establish the Freemantle Dockers AFL Club in 1995 and was responsible for marketing and sponsorship at the club. David was also Chairman of West Australian Rugby League for 3 years and oversaw the launch of the new NRL franchise, the West Coast Pirates, which is poised to join the NRL. Sideffect is a registered Australian not-for-profit organisation on a passionate mission to stop the tsunami of destruction hitting our youth, workforce and community. Sideffect's mission is to educate everyone in Australia about synthetic drugs – what’s in them, what they can do to you, and how they can affect your family and community – so that people are able to make informed decisions based on knowledge and awareness, not misinformation and ignorance. As part of this, Sideffect has rolled out the Orange Card, a program designed to tackle the growing illicit drug problem encountered in Australian workplaces. This program has been developed to keep both employers and employees protected. Contact eventswa@amcham.com.au for more information.